We can start with what most people want to know, how long will it fly and how much can it lift? 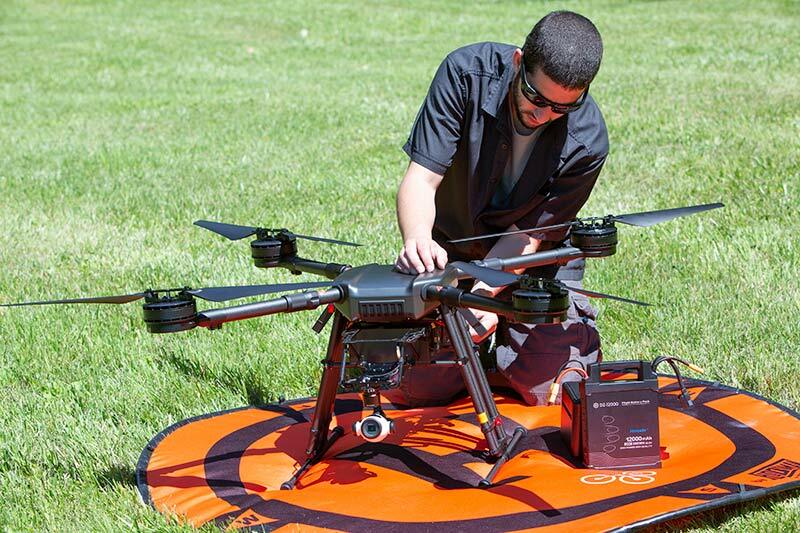 We utilized a 1 battery setup in our testing, powered by the DZ-1200 Flight Pack. This is the same battery used to power the AGRAS MG1-S and the Wind 8. 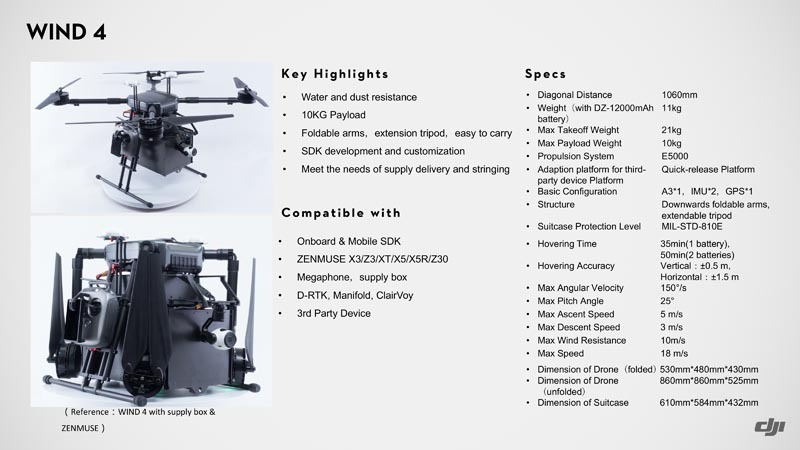 This provided us with an easy 30 minute flight time, but keep in mind we were only hanging the Zenmuse Z3. I trust with a few more pounds hanging below you would be looking somewhere in the 20 minute range, leaving plenty of juice to safely return home and land. You can also utilize a dual battery setup giving you some additional flight time. Looking at the drone you will notice one thing right of the rip, those motors and propellers, they are huge. The motors are the DJI E5000 swinging 28" propellers. 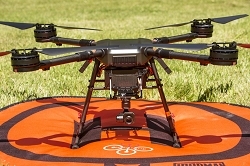 This allows the drone to lift an all-up weight of 22 lbs. The body of the Wind 4 is IP56 rated, giving you some protection against the elements and a safe flight home if the weather decides it doesn't want to cooperate. You are left with a variety of payload options. From supply boxes to DJI's enterprise cameras, the Wind 4 can handle it all. If you are feeling creative we can even talk about custom payload options. The landing gear is adjustable to accommodate a larger payload, with no tools required. 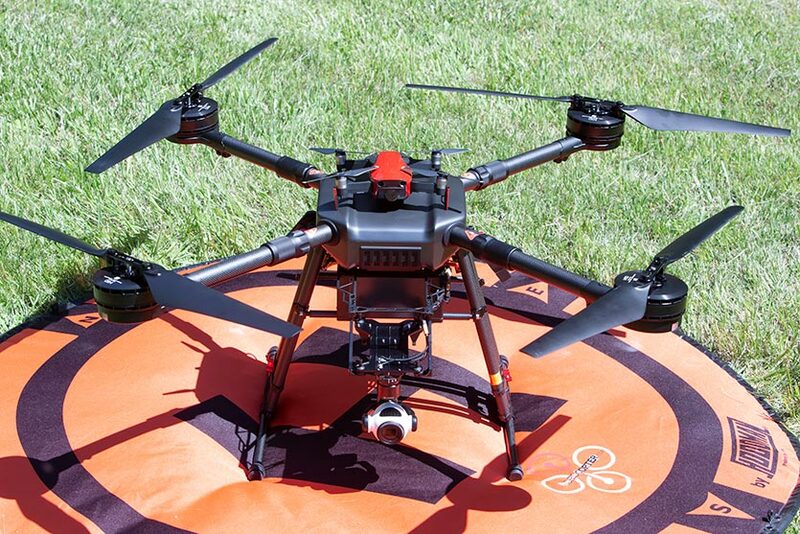 This system uses the DJI A3 flight controller, with dual IMU's for a stable and reliable flight. 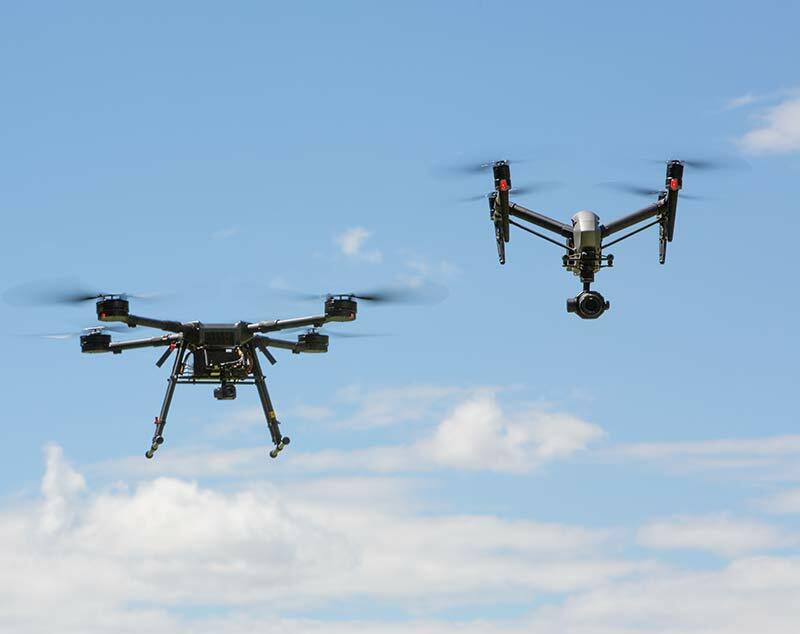 The DJI GO app is the software used to fly, however you can also plan autonomous flight missions through DJI Ground Station Pro. The transmitter used is a common DJI controller. Once it was finally time to fly the Wind 4, we were pleasantly surprised. The larger props had a deep hum that put a smile on our faces. She hovered nicely and was able to hang with the smaller Inspire 2 with no issues. It certainly did not have a big heavy drone feel, and for the brave few who switch to sport mode, you can see what it can really do.